In Diablo III, Sanctuary represents the human realm and physical world created between the High Heavens and the Burning Hells. And thanks to the Nintendo Switch it's everywhere you go. Blizzard’s Diablo series is renowned. Not just for creating (or having a heavy hand in), but perfecting the action-RPG. A style of game where fast-paced combat, deep character customisation and progression revolves around growing more powerful as a hero. The RPG side means a steady stream of treasure and loot to discover, both hidden in chests and among the remains of slain demons. Shiny bits of equipment that can alter everything from survivability to the power of a specific skill at your disposal. With each new weapon, item or piece of armour discovered, your Monk, Barbarian, Wizard, Crusader, Witch Doctor, Necromancer or Demon Hunter grows in demon-slaying stature and notoriety. And you, the player -- ever more confident that you can succeed in your quest to stop any and all evil lurking throughout Sanctuary. 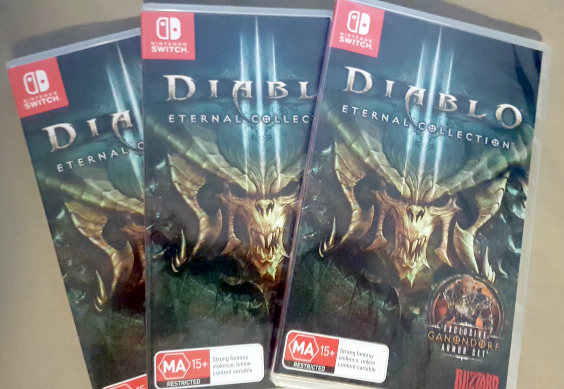 Arriving for the Nintendo Switch in a smooth, fast and visually-rich complete edition, firing up Diablo III: The Eternal Collection for the first time immediately feels unlike anything the franchise or genre has seen before. Namely because, thanks to the portability of the console, your journey doesn’t stop when you close the front door. That’s where it begins. Don’t let the name fool you, the world of Sanctuary as seen in Blizzard’s Diablo III is not a place full of rainbows and unicorns. Although, in a clear bit of fun, a hidden realm almost exactly like that called Whimsyshire can be found in your travels. Hidden behind a rainbow coloured portal left behind by one of the rarer Treasure Goblins that roam the dungeons, plains, and depths of Sanctuary. But we digress. In Diablo III, Sanctuary represents the human realm and physical world created between the High Heavens and the Burning Hells. It’s here in ‘Sanctuary’, however, where the Eternal Conflict between angels and demons has spilled over into the towns, villages and once idyllic countryside -- and budding heroes have no choice but to take up arms and slay all manner of monstrosities. All in an effort to save the world and, naturally, look good doing so. A vast and thematically rich place to explore, Sanctuary is home to everything from large cathedrals adorning the tops of mountains; vast desert plains home to hidden villages and enclaves, fortresses built in middle of icy and rocky plains, addled with dungeons and keeps with subterranean architecture aplenty. Places you can visit from the comfort of your own home, or better yet, in your own travels, without suffering third-degree burns. Whether you’re on public transport on the way to school or work, sitting on a bench waiting for a friend, or on a long-haul flight – with Diablo III on the Switch, your surroundings slowly begin to fade away. In their place the fiery lamps of New Tristram begin to form; the last refuge for humanity. The place Tyrael -- fallen archangel -- solemnly begins to tell you that the threat of demonic invasion is far from over. And that the world of Sanctuary is on the brink of falling into darkness. Blizzard’s exceptional and industry leading art-direction and world-building not only helps create a feeling of immersion in Diablo III, but thanks to the portability of the Switch, can spill over into the real world. Where passengers on a train become the citizens of New Tristram and looking out of a window to spot a shop-keeper in an open doorway – you’ll begin to see humble Blacksmith Haedrig Eamon ready to repair your gear after an intense Rift run. Which are the fast and fun randomly generated dungeons of Diablo III’s Adventure Mode. Immersion is only one part of the equation, as playing Diablo III is chock full of small victories as you explore everywhere from the sandy dunes of the Howling Plateau to the feat of engineering that is The Bridge of Korsikk. As an action-RPG there is nothing out there as rewarding to play as Diablo III – both figuratively and literally. From levelling up to discovering new legendary items to equip, no quest or adventure comes without a sense of accomplishment or reward. And it’s with this aspect, coupled with the fun and engaging skill-based combat, that adds to the allure of portable on-the-go Diablo on the Nintendo Switch. An experience, like with any fun journey or road trip, shines with others. Meeting up with friends is something that we all do, or at the very least sometimes do whilst mostly trying to think of a new excuse not to. It’s no secret that activities in a group can be far more fun and rewarding than when experienced alone. The Nintendo Switch, with its ability to seamlessly connect to nearby consoles or even online, is a feature embraced wholeheartedly by Diablo III. And with the immersive world of Sanctuary to explore and slay demons within, joining up with other heroes is, to put it mildly, incredible. And remember, joining a group, both in Diablo III and out in the real world: what you wear is important. Whether it’s a fresh pair of jeans with a label no one will see but instantly informs you of the large sum of money it took to acquire them, or a new jacket sporting the colours of your favourite esport team - fashion is a part of life. In Diablo III, fashion takes on a whole new meaning. With the legendary items and weapons found throughout Diablo numbering in the hundreds, each with their own unique abilities and looks, The Eternal question of ‘What to Wear?’ becomes almost as important as the Eternal Conflict found within. Now, the easy route would be to sport the Nintendo Switch exclusive and very cool Ganondorf look – but that’s the sort of idea that everyone else has. Fashion is also inspiration, and with the ability to play Diablo III anywhere and everywhere you can treat visiting a clothing store in a busy shopping centre as walking over to Myriam Jahzia the Mystic. Using the tops, pants and various shoes you see to dye and transmog every piece of armour you’ve got equipped (ie alter the overall design). And unlike in the real-world, add some Critical Hit Chance to a pair of gloves for good measure. Diablo III’s arrival on the Nintendo Switch highlights the many joys to be found playing the game -- both solo or in a group. With the console’s portability, the alluring world of Sanctuary and the seemingly never-ending quest to slay demons and save the world -- is an all-encompassing adventure you can take on the go. And with Blizzard’s knack for creating immersive worlds and universes that feel alive – having that adventure spill over into the real world, much like the nasties from the Burning Hells - is a welcome bonus. This article is brought to you by Diablo III: Eternal Collection for Nintendo Switch. How many times am I going to buy this bloody game? Edit: wtf this game is MA15+, the same category as Black Ops 4 and GTA IV? Get the f*** out, I'ma break the law on this one it seems. Did you buy three copies hoggy? I bought it not knowing how much I was going to play it (already own on PC and PS4), and dumped 30 - 40 hours in real fast. Waiting for next season now. Great to play on the couch while watching TV. I’ve also found the same with Smash Ultimate. Lots to unlock. Easy to pick up and put down while watching TV. I love the switch! Despite being nearly all physical with my switch collection, I got these 2 games digital and I’m regretting not doing the same for MarioKart. I don’t want to screw around with carts when I feel like playing one of these games.